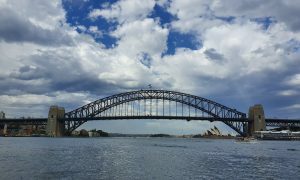 Mobile payment system Apple Pay launched in Australia late last year to the relief of many who had been waiting for it, but with a simple issue that prevented many from using it. It is limited only to American Express issued AMEX cards – and while that’s great for those of us with such a card, it’s a bummer for the millions with iPhones and Bank credit cards – could all that be about to change? 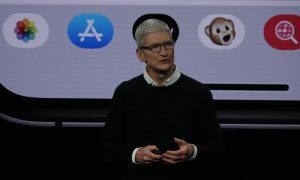 We always knew it would take just one bank to tip the scales and force the hand of the big four – and it seems the ANZ is very much in the testing phase – either that or someone’s got their Apples and Androids all mixed up. Google announced late last year that their own Android Pay would be available in Australia in “the first half of 2016” and there’s still plenty of time before we call them on that one. 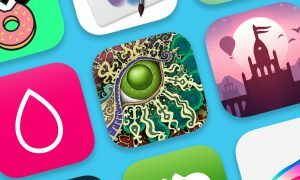 But it seems some Android users have been testing the waters and finding mixed success. 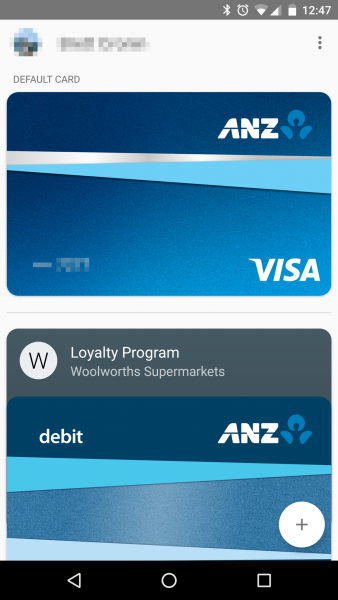 Some ANZ customers have been able to add their ANZ cards to their Android phones. The ANZ’s choice of email address seems to indicate they are either rick-rolling the heck out of us here or they are well down the path of testing. 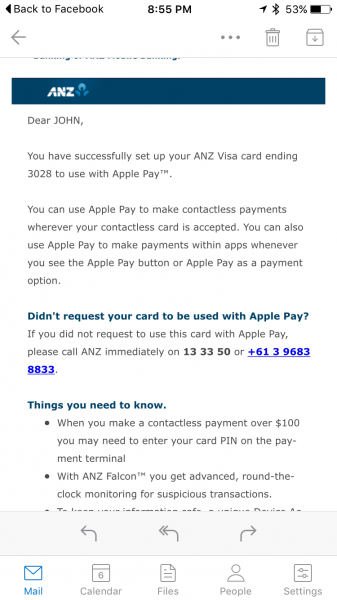 Likewise within the emails – it’s all about Apple Pay. 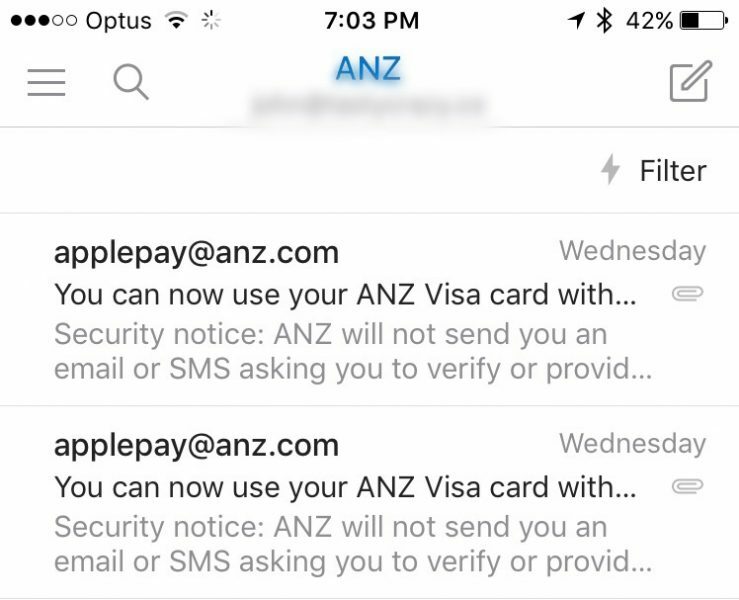 We’re hearing conflicting reports, some say people are getting text and email confirmation from ANZ after attempting to add an ANZ credit card to Apple Pay. 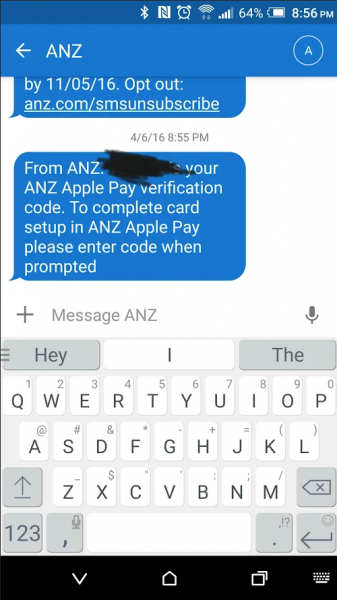 However, it seems more likely to me (having tested that theory with a large sample of ANZ customers) that ANZ is sending “Apple Pay” confirmation emails and texts to Android Pay users. Oops. Whatever the case, we’re pretty confident that this is the sign that our banks are about to move on Apple Pay – after all, despite the battle for a few micro cents in ever dollar, it’s not a good look to launch Android Pay without Apple Pay – the big banks don’t want to have to try to explain that to their mass base of customers. Perhaps better to announce both at the same time and launch with a bang? We’ve asked ANZ for comment – not holding our breath, but we’ll let you know. This is fantastic news! Currently with NAB, hate carrying cards and would love to do away with them, just tweeted ANZ (and tagged NAB in it as well) to try and get some confirmation, not holding my breath though. If it does become true and NAB has no very near future timeline, I will move my banking without second thoughts. I have been trying for months to add my ANZ visa to Android pay, and have now successfully added the card & used it a few times. Very hit & miss with which shops it works at though. For instance, I have used it a couple of times at one 7eleven, but at others it fails. Same is true for ANZs new tap & pay app also. I’m using a nexus 6p & got the Apple pay confirmation email on Android. It seems Citi and ANZ are in early stages. I tried other cards from BankWest and Macquarie and the error message is the old stock standard. What makes you say Citi is on the planning stages too? So, when I tried/tested adding my ANZ Visa Debit to ApplePay today, I got a different message to the previous times I have tried… Today the alert said “This card is not eligible for Apple Pay” instead of the previous message which said “Your Issuer Does Not Yet Offer Support For This Card”. Is this a new message for everyone, or just me? I am still getting the latter message on my ANZ MasterCard which is interesting.